Islamist rebel groups in the Syrian city of Aleppo say they reject the new Western-backed opposition coalition. In an internet video, they denounced what they called "the conspiratorial project" and said they intend to establish an "Islamist state" in Syria. The EU recognised the new coalition on Monday as "legitimate representatives" of the Syrian people, but did not grant it full recognition. France has already backed the group as "sole representative" of Syrians. Known as the National Coalition for Syrian Revolutionary and Opposition Forces and formed in Qatar on 11 November, the opposition has also been given full recognition by Turkey and the six Gulf states. The UK may also follow suit, with Foreign Secretary William Hague due to make a parliamentary statement later on Tuesday, BBC Diplomatic Correspondent Jonathan Marcus reports. Mr Hague met the three main leaders of the new coalition in London last Friday, and told reporters in Brussels on Monday that he "was impressed with their objectives... their determination to be inclusive in Syria of all communities and groups within Syria". Respect for human rights and inclusivity were essential preconditions for UK recognition, our correspondent adds. Recognition for the opposition grouping would open the way to additional practical and political assistance, but falls short of arming fighters on the ground. In Syria's second city, Aleppo, Islamist rebels are unimpressed with the new grouping. In a video posted online, an unidentified speaker sits at the head of a long table with representatives of 14 armed Islamist groups who reject the opposition coalition. The groups included two of the main fighting factions in Aleppo, the al-Nusra Front, and the Tawhid Brigade. "We are the representatives of the fighting formations in Aleppo and we declare our rejection of the conspiratorial project, the so-called national alliance," he says. "We have unanimously agreed to urgently establish an Islamic state." The significance of the video proclamation was played down by the opposition coalition's new leader Moaz al-Khatib, who said in Cairo: "We will keep in contact with them for more cooperation in the interest of the Syrian people". Mainstream rebel groups, such as the Free Syrian Army, have generally welcomed the new coalition leadership, the BBC's Jim Muir reports. US State Department spokeswoman Victoria Nuland said it was "not surprising to us that those who want an extremist state, or a heavily Islamist state in Syria, have taken issue" with an opposition endorsing pluralism and tolerance. But it will serve to increase fears among some Western nations who are already concerned that any arms sent to help the rebels in Syria could end up in the hands of extremists, observers say. The EU's 27 foreign ministers, meeting in Brussels, said they considered the opposition coalition "legitimate representatives of the aspirations of the Syrian people". "This agreement represents a major step towards the necessary unity of the Syrian opposition," they said, stopping short of offering full diplomatic recognition. Last week, US President Barack Obama welcomed the coalition, but said the US wanted to make sure it "is committed to a democratic Syria, an inclusive Syria, a moderate Syria" before giving full recognition. Inside Syria, nearly 100 people were killed on Monday, the UK-based Syrian Observatory for Human Rights reported. Fighting continued on the southern outskirts of the capital Damascus, with Reuters reporting that Syrian rebels had seized the headquarters of an army battalion there. Nato is considering a request from Turkey for ground-to-air missiles to help protect its border with Syria. 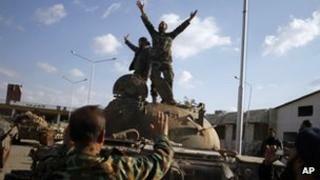 More than 38,000 people are believed to have died in the 20-month uprising against the rule of President Bashar al-Assad. International charity Save the Children has warned that 200,000 Syrian refugee children are at serious risk from freezing temperatures, as winter begins in the Middle East. Many families have fled across the borders to Turkey, Jordan and Lebanon to escape the conflict, and more than two million people are displaced within Syria - living without the proper shelter and clothing to survive the falling temperatures.